When in The Fifth Element the Mangalore Aknot calls Zorg to report that the “mission is accomplished,” we get a few seconds of screen time with Zorg’s secretary who receives the call. During this moment, she’s a bit bored, and idly shoves a finger into a small, lipstick-case sized device. When she removes it, the device has colored her fingernail a lovely shade of #81002c. The small device is finger-sized, the industrial design feels very much like cosmetics, and its simple design clearly affords inserting a finger. There’s also a little icon on the side that indicates its color. This one device speaks well of what the entire line of products might look like. All told, a simple and lovely interaction in a domain, i.e. 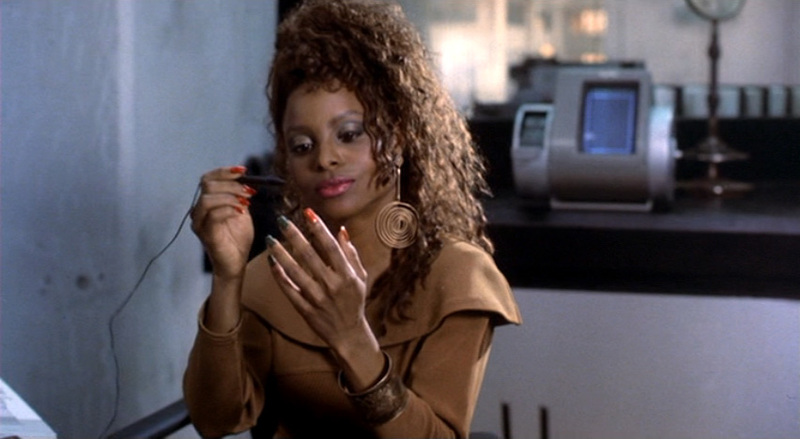 cosmetics, that typically doesn’t get a lot of attention in sci-fi. But what is even more remarkable is that this isn’t the only fingernail interface in the Make It So survey. There is one other, 7 years earlier, and it happens to be used by someone with the exact same job. This other interface comes from the 1990 movie Total Recall. As you can see, this receptionist has an interface for coloring her nails as well, but the interaction is entirely different. This device has something like a a tablet with a connected stylus. It displays 16 color options in a full screen grid. She selects a particular color with the tap of the stylus. Then when she taps the stylus to a nail, the nail wipe-transitions to the new color from the tip to the cuticle. This device is cumbersome. It’s not something that could fit into a purse. Does she just leave it on her desk? Doesn’t her supervisor have opinions about that? My sense is that this is something better suited to a salon than an office space. As a selection and application mechanism, the stylus is a bad choice. It requires quite a bit of precision to tap the tip of the nail. Our old friend Paul Fitts certainly would use something different for his nails. Since the secretary has to have to have some kind of high-tech coating, perhaps similar to electrophoretic ink, why is the stylus necessary at all? Can’t she just tap her fingernails to the color square of her choice? That would disintermediate the interaction and save her the hassle of targeting her nails with that stylus, especially when she has to switch to her off-hand. The color display poses some other interesting problems as well. It needs to show colors, but why just 16? We don’t see any means of selecting others. Are these just this season’s most popular? Why not offer her any color she likes? Or some means of capturing her current outfit and suggesting colors based on that? Even the layout is problematic. Because of the effect of simultaneous contrast, the perception of a color alters when seen directly adjacent to other colors. These squares should have some sort of neutral border around them to make perception of them more “true.” But why should we burden her with having to imagine what the color will look like? Show her an image of her hand and let her see in advance what the new color will look like on her fingers. Any sort of low-level augmented reality would help her feel less like she’s picking paint for her living room wall. 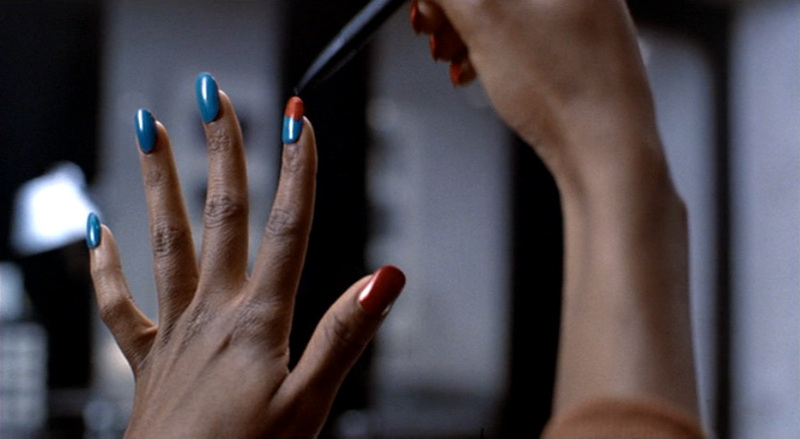 Comparing the two, I’d say that The Fifth Element fingernail-o-matic wins out. It’s more personal, more ergonomic, fits into the user’s lifestyle more, feels more fashionable than techy (which that receptionist clearly cares about). Yes, it’s more restricted in choices, but I’d much rather figure out how to augment that little device with a color selector than try to make a stylus and tablet fingernail-o-matic actually work. Posted in The Fifth Element (1997), Total Recall (1990). Tagged affordance, beauty, cosmetics, fashion, Fitts' Law, stylus, usability, Who Did it Better?